People ask questions, share their experience and tell stories on Quora. This being said, we suggest marketing your product on Quora not in old traditional fashion, but in brand new light! How to use Quora for marketing? How to find relevant questions to answer? How your answer can generate clicks and leads to your website? Get the answers to these questions and your business will surely do the trick! As Bill Gates once said, the future of advertising is the Internet. Indeed, nowadays, there are numerous ways and channels to promote and advertise a product and Internet made this process much easier. Social media and other platforms are now there to help businesses spread awareness among people through marketing via their sites. Imagine Facebook! You scroll down your feed to see what new your friends have got to share, and suddenly, in the right upper corner, you notice a special offer that your favorite boutique holds. That’s a simple example of how the Facebook Ads work, a way of marketing, that pops up on the screen when you just surf your newsfeed. However, the opportunities of online marketing are not restricted to Facebook or Twitter only, and today I am going to introduce Quora. I can surely say that Quora is the best Q&A site that one can come across on the web. Their main goal revolves around information sharing, generally profitable inquiries and answers, and top to bottom experiences on different subjects, running from current occasions to more professional topics. Quora was launched in 2010 and from that point forward, it has developed into a substantial community that includes a lot of specialists and industry influences that answer inquiries all the time. It has more than 200 million unique monthly visitors, which gives you a truly smart thought of how enormous this community truly is. More than 200 million individuals come here to search for learning, tips, news or just to take part in buzz that goes around. 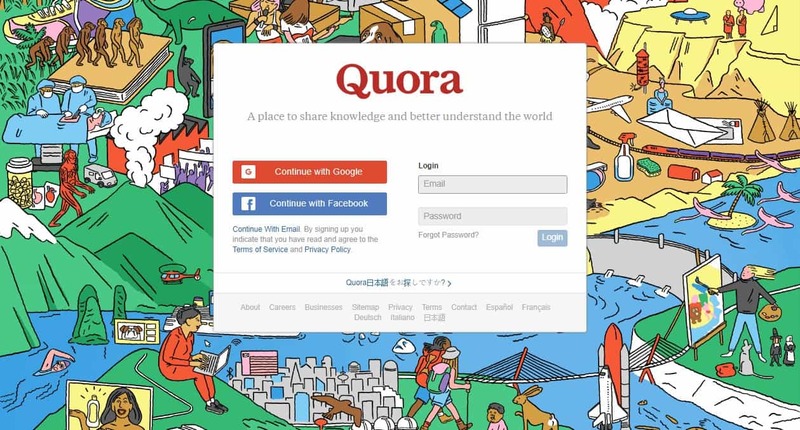 Other than being an incredible place where you can get information, read helpful hints and traps and get the most recent news, Quora can be a profitable channel to create brand awareness for your business. By answering to questions that are within the framework of your operations, you can pick up fame and position yourself as an expert on that topic. What makes Quora different from other platforms is that you have to contribute with really insightful content to be successful. In other words, your answers should be useful for others to make you stand out on the platform. This way Quora self-controls the content and kills spam. To understand how to get the most out of this social channel, ensure you closely follow every step mentioned in this article. What characteristics a good Quora profile should have? First and foremost, people value real information that you give them about yourself. According to research, people perceive information better, if it’s “delivered” to them by a real person. This means that you should introduce your real name, surname, age, etc. as well as consider uploading a headshot picture of yourself as a profile pic. Be as real as possible. Provide your readers with information about your education, current employment, hobbies, interests and other staff. After you have set up a credible profile, it’s time to narrow down the general stuff to a real marketing. In order to have an interesting feed and broad audience, you should add all the topics that are relevant to your business or company. Of course, you are welcome to add many more general topics that are widely discussed. Whatever topic you add make sure your answers are informative and valuable. Try to contribute with real life advice and examples. For the readers, this will create a sense that you are an ordinary person just like they are, so they will appreciate and follow your advice even more. Include all topics that you like, from wide interests, for example, a small business management, to extremely particular ones like on-page SEO. 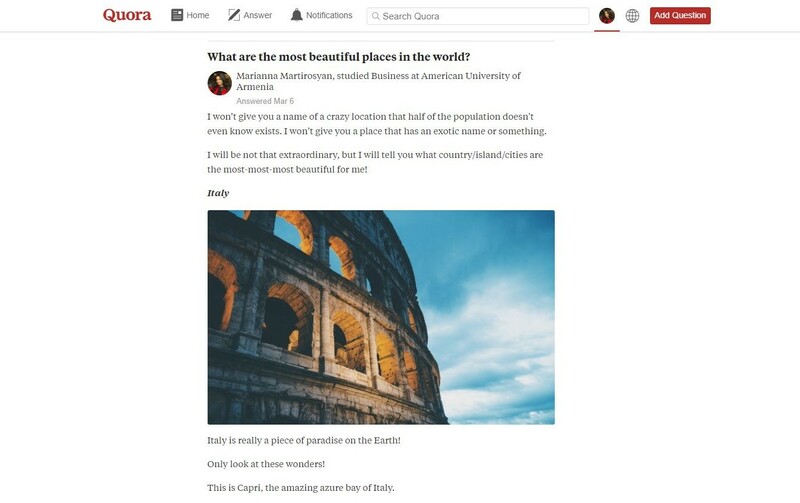 Finally, the third step I recommend undertaking is linking your Quora account to your other social media accounts to be able to easily share your answers and get more reach. But, more importantly, by connecting your accounts you’ll grow your following on Quora much faster because your friends and connections will easily find your profile. The fundamental purpose behind having a Quora account is to offer awesome responses to pertinent inquiries and build your brand awareness. To have the capacity to do that, you first need to find out about all factors that influence the popularity of your answer. For your answer to be really successful, you need to go through these three steps: find a good question, write a cool answer and finally rank first and get traffic. How to find a good question? As you will see, there is a huge amount of questions on various topics. Your feed will be populated in connection to topics that you've picked as your interests yet additionally to other at present drifting themes. This being said, you can find numerous questions on relevant topics both by searching them out and by looking through your feed. The other alternative is to discover great questions using Google. If you have a SaaS organization, your inquiry may include: "name of your niche+Quora"; or "issue that your apparatus fixes+Quora"; or "[your contender's name] alternatives+Quora". You should think of keywords that your audience would have used to find a solution to their issue. You will see that those answers that are shown first in Google are typically the best ones in terms of relevance and importance. If you combine these two ways of finding a good question, you’ll surely get there faster. However, another question may arise here: What is the best question that will help my brand get more popularity? You can't know for beyond any doubt which question will have the greatest effect, yet there are a couple of parameters you should take in thought: the number of views, the number of followers, the time the question was last asked, the number of shares and comments. Here everything is much simpler! I’ll repeat myself here: to have good answers you should write really informative, precise and insightful ones. Even if you are advertising something, be straightforward because Quora community is rather negative about spam and blunt sales. You are a small business owner willing to promote his brand? Fine! Write on your own name and state clearly that you are the CEO of the above mentioned company. Don’t pretend to be a passerby who is astounded by the amazing services the company offers. Throughout your whole Quora Marketing/Promotion journey your content should be definite, logical and to the point. Don’t hesitate to share your insight, genuine experience and valuable resources - the more actual value you give, the more popular you'll be.Adhere to the subject and give your honest sentiment. Don't simply express something very common, or something that can be found on each and every site, try to give your one of a kind viewpoint. You should include reasonable cases and lessons you have learnt through training. The “look” of your answer is not less important. Use subheadings, bold and italic letters to catch the reader's attention. For a travelling topic, use nice pictures to make your answer more enjoyable, for a website building topic, include screenshots of the procedure you are trying to explain. This will affect the positioning of your answer. How To Rank Quora Answers? Now that we have covered everything profile and content related, there is only one thing left to mention - the upvotes! Quora has its own framework that gives the community and individuals a chance to demonstrate their thankfulness (or dissatisfaction) through upvotes and downvotes. Legitimacy of your profile - use of your real name, real experience, your picture and connection with other accounts. Quality of your content - in-depth, valuable answers, with nice images and pleasant formatting. Upvotes - the more upvotes from Quora community, the bossier! Well getting upvotes on your answers will surely make you better off, however to really become a part of community, you too should “participate” in that Quora thing. View and read answers, upvote or downvote ones, leave comments and contribute with your opinion. Follow influencers of your business-related field to gain more knowledge and insight on the topic. Build a community and become a part of one! When you post something of value that is highly relevant to your audience, that piece of content has a short shelf life before it gets lost in the sea of content spewed out in every given second. Of course, you can invest some money to broaden the reach of your post and put it in front of more people, but keeping it organic sounds better, doesn’t it? You know why is Quora beneficial in the long-run? Because unlike many other platforms, your responses on Quora don’t get lost. In other words, if you’ve made an efficient contribution to the platform, it will still rank and keep it’s high position for a pretty long time. Though Quora values new answers, it places emphasis on quality. 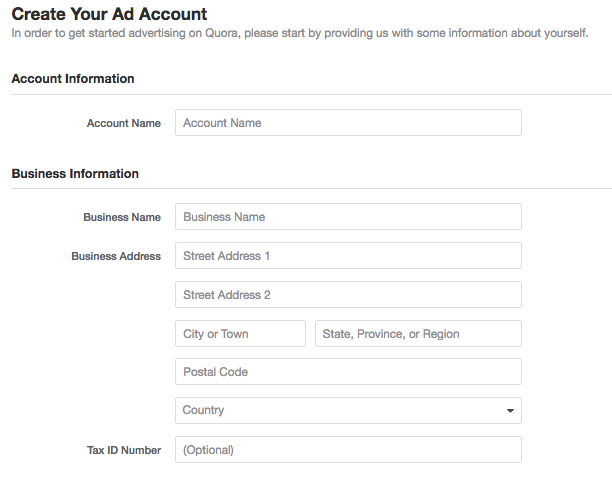 And a dramatic drum roll: Quora has an advertising option! Just like elsewhere on the platform, here again Quora values high-quality and good reputation. This being said, in order to be able to advertise on Quora, your ads should pass a review. This process review may eliminate some companies and industries ads, but Quora has its way of fighting fraud and false advertisement. Incorrect/unusual use of capitalization and abbreviations: It’s not permitted to use unnecessary capitalization in Ads. Commonly known abbreviations are permitted, but where possible, the full word should be used. Unsubstantiated competitive claims: Competitive claims in Ads (#1, best, better than, etc.) may be considered misleading unless a 3rd party comparison that substantiates your claim either in the ad copy or on your landing page is included. So once you’ve clicked that magical “Create Campaign” button on Quora Ads Manager, you’ll be presented with a series of options that will help you craft a winning campaign. You will have the option to name your campaign and choose a budget for it. Afterwards, you’ll be given two options to choose from: daily maximum budget and lifetime budget. The next step is to decide whether you want to to start your ads right away or postpone them and set a certain start and end date. The next move is all about the targeting. 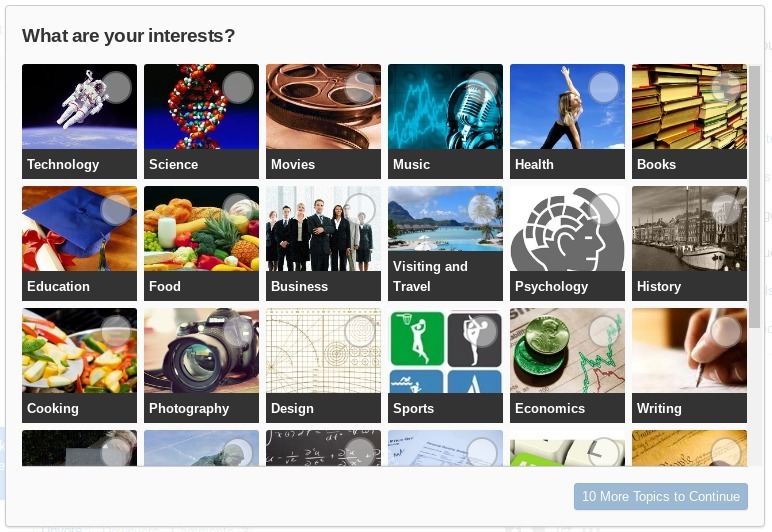 The main differentiator is that you target people by topics they follow on Quora. The main choice is to do your research on your own and discover points that are important to you and your audience. This is a bit tedious, yet it will give you a superior picture of what your intended interest group peruses and reads. The other alternative is to enter relevant keywords (you can utilize catchphrases from your AdWords campaign, on the off chance that you have one), and those keywords and topics will be coordinated with comparing points. The list of topics you'll be given will be too long and excessively wide, so you'd better uncheck the subjects you're not interested in. 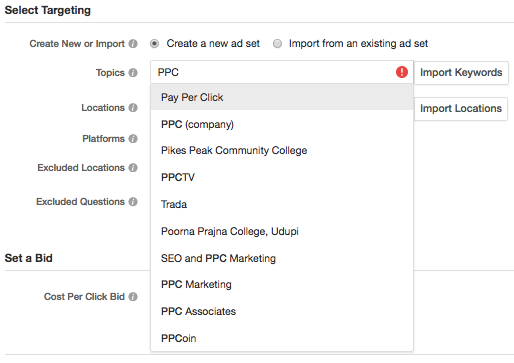 You can likewise pick the locations you need to target and platforms on which your promotions can be shown. Another intriguing choice that can additionally narrow your audience is the alternative to exclude locations and questions. Along these lines you can omit countries for which your company can’t be of any service, geographically. Since you've set your audience, you can proceed onward to setting your bid. This implies you have to enter the maximum amount of cash that you’re ready to pay per a single click. Quora promotions utilize just pay-per-click model, which implies you can't be charged for impressions like on Facebook. When you’ve made all the changes here, it’s high time to move to the creative part. You’ll have 65 characters for the headline and 105 characters for description. In addition, your ad must be in the form of a statement, it cannot contain a question. Choose from a variety of CTAs and add both your landing page and displayed URLs, and you are good to go! 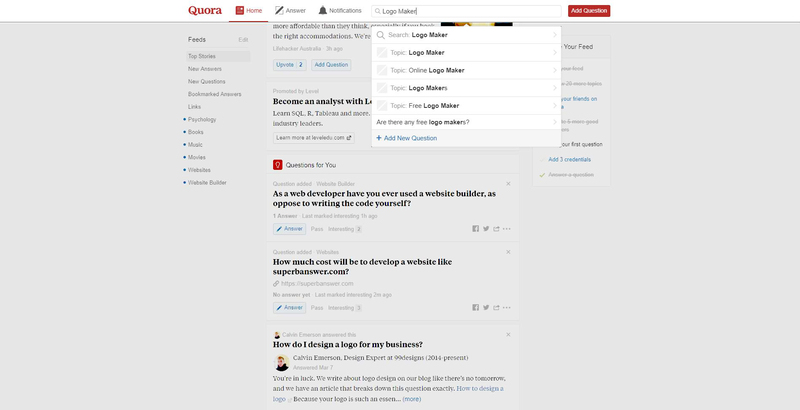 Quora pixel is another useful tool we recommend installing to go pro! 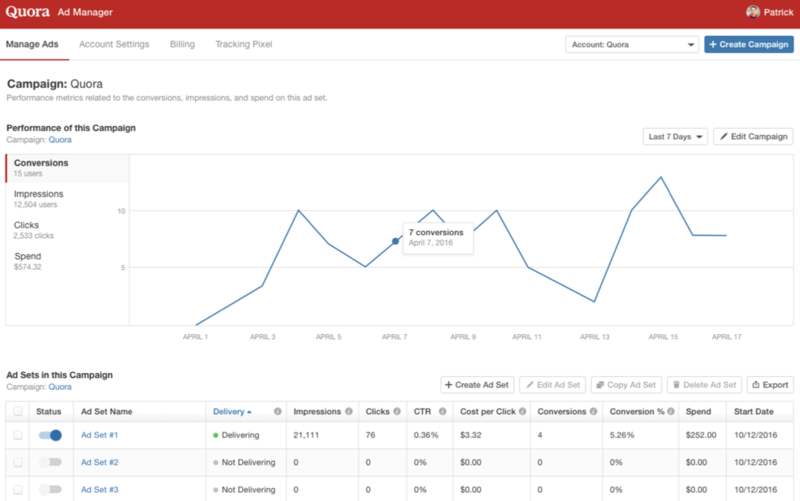 It will allow you to see conversion data for your campaigns in the Quora Ads Manager, driving bits of information that can help streamline your performance and meet your objectives. The pixel lets you track the buzz that went on your website as a result of Quora advertisement. 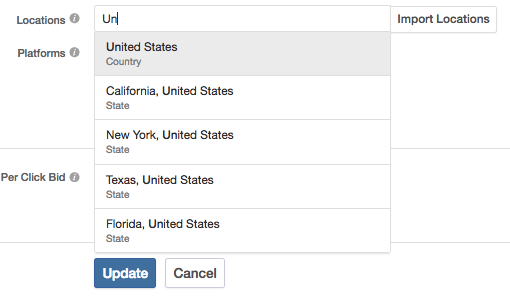 With its latest update, Quora announced the release of multi-event conversion tracking, view-through attribution and an update to its reporting interface. Utilizing Quora's tracking pixel, promoters would now be able to track and optimize against more than one conversion event. Existing pixel implementation will be followed under the "generic" occasion tag. To use multi-occasion conversion tracking, advertisers need to include the significant relevant conversion event tags to their base pixel code from the “Quora Pixel” tab in the Ads Manager and then update the code on their sites. But this is just the skeleton! To reach more people and raise awareness about what you offer, you will need Quora Ads, and consequently the Pixel tool. Through campaigns, you’ll be able to reach the multi-million potential customers and promote your product more beneficially. All left to do is to screen the outcomes and advance your campaign, if necessary!